Above: The perfect plate of nachos Photograph by Douglas Merriam. DURING A RECENT UNASSUMING EVENING in the Plaza de Las Cruces, tweens in mariachi attire filled their plates alongside hungry Las Crucens and curious visitors. They hardly put a dent in the offerings: A 110-foot-long table held a staggering 5,039 pounds of nachos. “Noche de Nachos” was a community effort—11 vendors and restaurants donated the seven ingredients while young performers crooned in the nearby amphitheater. It was for a worthy cause. Las Cruces won the unofficial Guinness World Record for the largest serving of nachos. Take that, previous record holder University of Kansas. If nothing else, the new, noble title has moved a little closer to the origin of the dish. In 1943, Ignacio “Nacho” Anaya, a maître d’ in Piedras Negras, Coahuila, Mexico, needed to serve the wives of U.S. soldiers stationed in nearby Eagle Pass, Texas, who had come for a visit. The kitchen had closed for the day, but, in a pinch, Anaya fried up some corn tortillas and covered them with melted cheese and sliced jalapeños. Nachos Especiales was born. The ingenious, resourceful invention quickly spread throughout the Southwest, and Nacho’s hometown still celebrates International Nacho Day every October in his honor. Today, the word nacho is like the word sandwich—it’s more of a category that covers a broad range of foods. 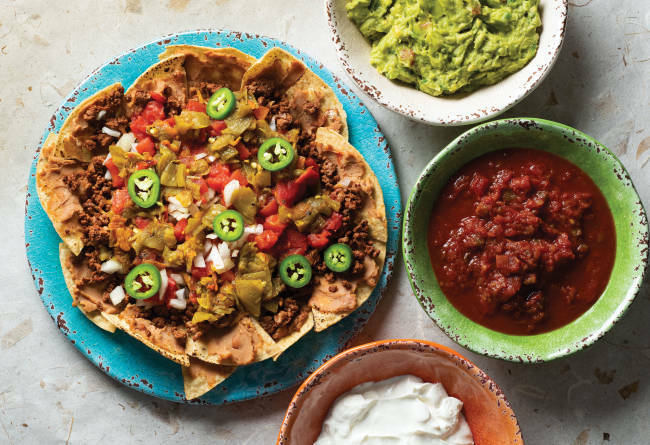 In theory, one could have a different style of nachos for every meal of the day (and that would be a great day). Indeed, there are breakfast nachos, vegan nachos, fried-chicken nachos, pizza nachos, nacho salad, spaghetti nachos (which we cannot recommend), poutine nachos, s’mores nachos, and of course, ballpark and high school gym nachos. These are not that. You will not find pumpable cheese here, although there is nothing wrong with cheese that comes out of a dispenser. Nacho ubiquity does not imply nacho simplicity. The perfect nacho—that’s a complete chip, toasted golden brown and covered in the proper proportions of beans, cheese, guac, green chile, your meat of choice, and magic—is a lifelong quest. Some never find it. Does any food demand such art and engineering? La Choza, in Santa Fe, which thrives because pilgrims come for its red and green chile, has figured it out. So has El Patrón, in Las Cruces, where brisket is the star. Those places understand that a plate of nachos is like a well-built house. You need a strong foundation and the right layers to build both up and out. Someone once said that the only thing worse than a soggy chip is a dry chip. Have truer words ever been spoken? One summer afternoon, I attended a house party where a friend was testing barbecues for work. Santa Fe resident Dave Cox was there. We all have our devotions. Cox is a man of the nacho. He brought over a plate of his craft. I believe I ate the bulk of that plate—other guests be damned. His recipe benefits from a smoker, but an oven will do. However you make it, do as Cox does and bear in mind that proper chip-to-topping ratio is the most critical part of the mission. Fry ground elk, bison, or beef with oil, red chile powder, chile caribe, kosher salt, and cumin. Don’t overcook the meat, because it will cook again on the nachos. Arrange the chips to cover a pizza screen (one of those pans full of holes) and top with meat and cheese. Dave uses his Traeger wood-pellet stove at 250–300° to smoke the chips, but an oven will suffice. Once the cheese starts to melt, top with diced tomatoes, onion, and green chile. When toasty brown, about 10 minutes, garnish the nacho pyramid with guacamole, sour cream (if that’s your thing), and salsa. 2. Beans: Refried, black, pinto, kidney—whatever your jam, cover every chip. 3. Meats: Proteins to consider: brisket, elk, steak, chicken. Proteins not to consider: fish, tofu, protein powder. 4. Cheese: Do not hold back. We’re talking quality and quantity here. A brick of sharp cheddar will do. 5. Red and Green: Duh, this is New Mexico. Toss in some jalapeños, too. 6. 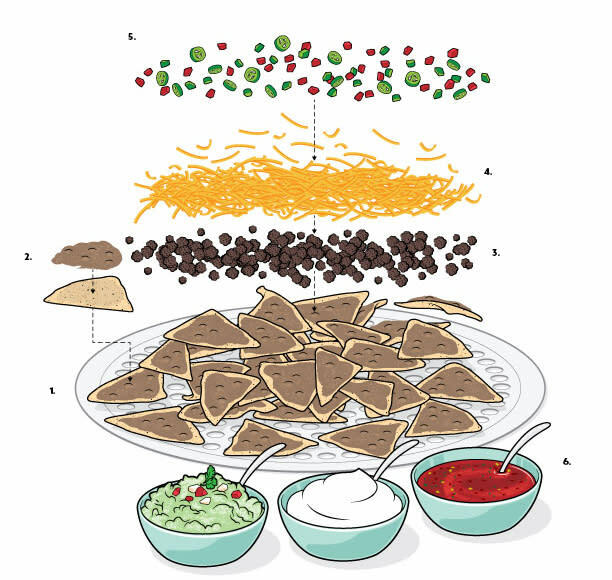 Accoutrements: Give the people what they want: more flavor, and more ways to ensure no chip is left dry, with guacamole, sour cream, and salsa.